The evans machiney model 1050 Ezy-T-Edge is perfect for the complete application of plastic T-molding, producing a smooth, even, contoured edge on tops, counter tops, door and drawer fronts, and a variety of work surfaces. Plastic T-Molding is applied to the material by a variable speed electric hammerhead. This operation assured better seating of T-molding than hand operation. 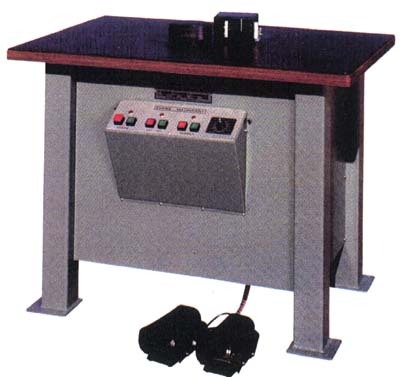 The 1050 required 80 PSI air supply and runs on 220 volt single phase at 1.5 KW. Miter Notching Index: Efficient operation with 3/16" tolerance on either side of miter notch. Eliminates buckling of T-molding when going around square or small radius corners.